The working age group 15-59 years accounts for 62.5 percent of India’s population. This immense advantage can create the space needed to increase investments in enhancing human capabilities. Ahmednagar: Vice President M Venkaiah Naidu Monday said a renewed focus on rural health care is needed, adding more needs to be done to ensure health security to India’s vast population. Naidu cautioned that the quality of healthcare being delivered cannot be determined by the price being paid. He was delivering the 13th Convocation address of Pravara Institute of Medical Sciences, a deemed university, at Loni in Ahmednagar district. Naidu also suggested a mandatory rural service of three years for doctors before their first promotion. He congratulated the 437 graduates who were presented degrees at the convocation and expressed delight that a large number of graduates who won awards and medals for excellence were women. “There is no tool for development more effective than women empowerment,” he said. Opining that the youth of India would determine its future, the Vice President quoted United Nations Population Funds report which said the window of demographic dividend opportunity in India would be available for five decades from 2005-06 to 2055-56, longer than any other country. “The working age group 15-59 years accounts for 62.5 per cent of India’s population. This immense advantage can create the space needed to increase investments in enhancing human capabilities, which, in turn, can have a positive influence on growth and development in the time to come,” he said. 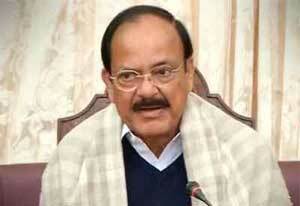 Naidu said urban areas had four times as many medical practitioners compared to rural areas. This rural-urban divide had to be addressed on a war footing, he added. The Ram Rajya cannot be achieved without attaining Gram Rajya, he said. Expressing concern over the rising costs of providing medical services, Naidu said the integration of technological innovation with healthcare delivery will certainly help in lower healthcare delivery costs. GOVERNMENT SHOULD FIRST BUILD ‘5 STAR HOTELS’ IN VILLAGES FOR THESE BLOODY doctors BEFORE MAKING SUCH A RULE SO THEY CAN LIVE A LUXURY, COMFORTABLE LIFE OVER THERE AND THINK DEEPLY ABOUT THE CONCERNS OF POOR VILLAGERS. Apply the same set of rules to management graduates, engineering graduates , lawyers and importantly politicians..
it is just a way to kill the talented people for petty politics, doctors have become easy targets.. high time these mindless politicians realize that its gonna back fire in a bad way in the long run..
good…. can you apply same rules to other facilities also…. Before thinking over 3 years rural service for doctors, government should provide the working environment, adequate staff and up-to-date infrastructure for concerned person to hold his post properly and work over there… Only doing postings in rural with present setups will only provocateur medicos to come back to urban areas instead of creating there own space in that working environment and will be more negative opinion perse. If services are good after 3 long years, many may consider staying back and serving instead of moving out of the place and this point should definitely be taken into consideration…UPGRADING THE STAFF AND INFRASTRUCTURE AND INSTRUMENTS according to need…. Most often the politicians are not aware of the facilities/infrastructure present in rural areas for health care services. Eg:- In majority of the primary health centres in India, sufficient medicines are not available for treating patients and this is not taken care of either by DMHO or regional directtor or even state director of health services. The MLA or MP will never visit the primary health centres present in their constituency and thus they are not aware o difficulties doctors are facing in treating patients. The vice president should address the members of Rajya Sabha and Lok Sabha and ask them to make a law that MLA and MP will visit at least once in 1-2 months all primary health centres in their area to find out the deficiencies/problems and submit a report to state government and central government to provide the required facilities to improve rural health care. They should also persue the matter until the work is done successfully. I am sure this is not palatable to anyone in the government. But, everyone can preach that compulsory rural health service for the doctors. GOD also can not save INDIA unless the responsible persons in the government change their behavior and perform their duties in the welfare of public.